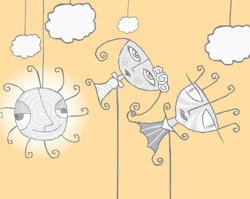 The book is based on the cartoon "Neva" from the project "Croatian Tales of Long Ago". 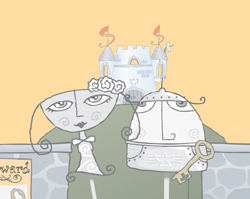 The story was retold and story adapted by Edgar Beals and Helena Bulaja. The book is available in three language versions - English, Croatian and German. Everything else in the package (DVD, CD...) is the same for all languages. 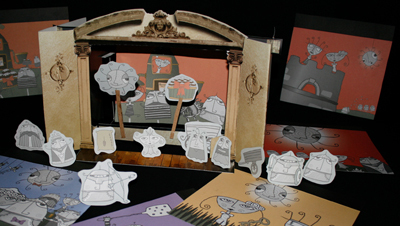 The cartoon "Neva" was made as a puppet play - everything is happening in a mechanical theater, the characters are on sticks, props move with wires... With this special edition the theater became real! extra information about the project "Croatian Tales of Long Ago", the authors etc. ringtones and background images for mobile phones. 4. CD AUDIO BOOK "Neva"
This is in Croatian only. You can hear how the tale sounds in its original language. The tale was read by the famous Croatian actor Marija Kohn. 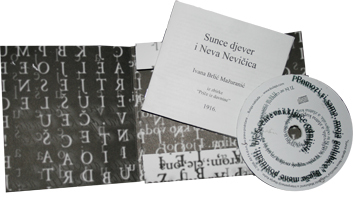 With the CD you also get a booklet with the original text of "Neva the Bride", as it was written in 1916 by Ivana Brlić Mažuranić. The story and the characters in black and white - for coloring and drawing! 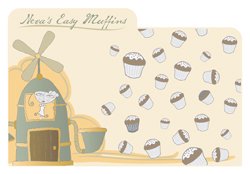 Recipes and so on (no joke!). to order "Neva" from our web shop, click here! 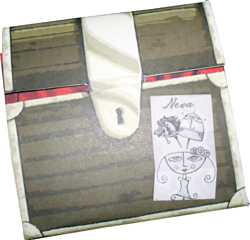 "Neva" is the second published package from the series of "deluxe" editions of stories from the project "Croatian Tales of Long Ago". Next one will be "Regoch" by Helena Bulaja, with more surprises, and then the remaining five fairy tales. You can see Ed's funny cartoons and other works on his web site www.edbeals.com. As a co-director, animator, photographer, cinematographer, editor... Ed is also collaborating on our new project "Mechanical Figures" inspired by Nikola Tesla. More about the multimedia project "Croatian Tales of Long Ago"
Our multimedia interactive e-book project "Croatian Tales of Long Ago" ("Priče iz davnine" / "Kroatische Märchen aus Urväterzeiten" - as you can see, available in 3 languages, with more translations on the way...) consists of 8 animated interactive stories and cartoons, inspired by the book written in 1916 by Ivana Brlić Mažuranić, "the Slavic Tolkien". 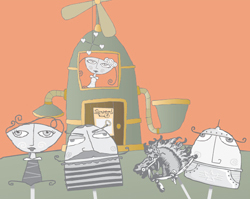 The originator and editor of the project Helena Bulaja gathered together eight teams of animators, illustrators, musicians, actors, translators, programmers etc. from different parts of the world and different traditions: from the US, Canada, Scotland, Australia, Denmark, Germany, Russia, France and other countries. 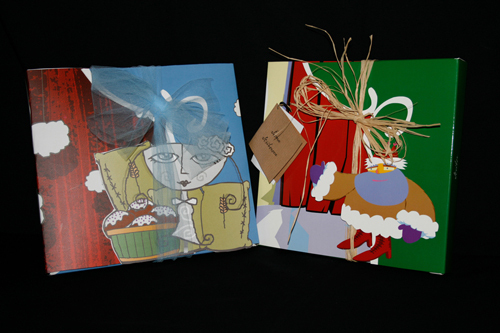 Each team chose one out of eight fairytales from the book and transferred it to the digital world. The result was an exciting adventure, because artists with different backgrounds, who were not familiar with Mazuranic's work and Croatia at all, and who never met each other in 'real' life before, made completely new interpretations of those beautiful tales! 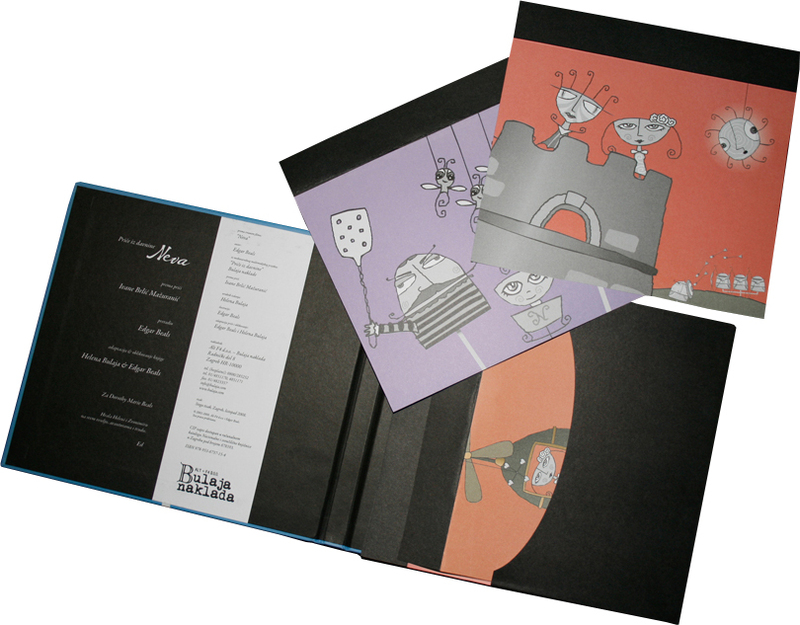 In 2007 we started to publish "deluxe" editions of each of the fairytales from the project. 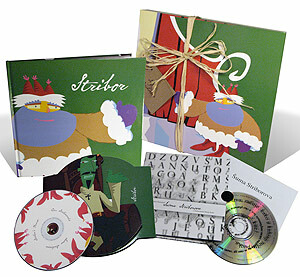 Before "Neva" we published "Stribor's Forest" based on the cartoon by the Scottish animator Alistair Keddie. 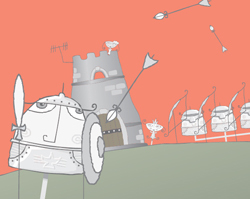 The project "Croatian Tales of Long Ago" was awarded, selected or presented on more than 30 important international festivals and conferences of animation, new media and design all around the world, including the most important ones (Flash Forward San Francisco, Annecy, Hamburg, Ottawa, Rio de Janeiro, Austin... the full list is available here). 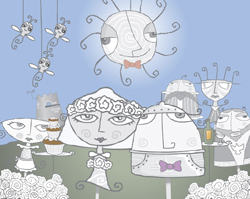 The cartoon "Neva" was in the competition of the most important world festival of Flash animation - FlashForward in San Francisco, in the category "cartoon". It also won honorable mention at the new media festival in Brudenell, Canada. It was screened on many other festivals on all continents. 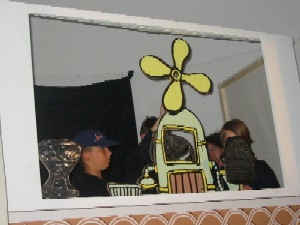 In 2003 at the International Children's Festival in Šibenik, Croatia, the Šibenik kids lead by Zdenka Bilusic turned the cartoon "Neva" in the real puppet performance! 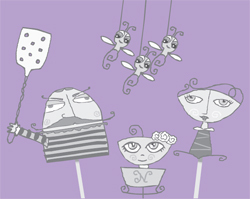 On www.bulaja.com/FAIRYTALES/ you can see an excerpt from "Neva", as well as from all other cartoons. The DVD is a standard PAL DVD that plays on all DVD players, and it is zone independent. NTSC version (used in USA, Canada, Japan...) will be available soon. 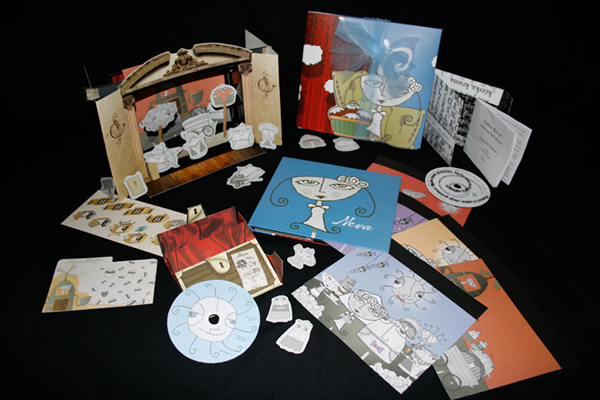 Interactive extras on the DVD can be run on any Windows or Macintosh computer. The mobile phone extras available on the DVD are also in standard formats and they can be used on all phones. Instructions how to transfer them to your phone are also included. From the Bulaja's manufacture we got another real sensation for children! Parents of 4 children, the Bulajas understand better than anyone else the sensibility of the modern kids, which from their early days sit in front of computer and TV screens. 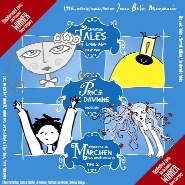 But with their products they offer them the entrance into the magic world of classical fairy tales, where the kids can practice their creativity in a completely modern way. 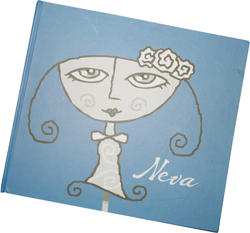 "Neva", the second, new pack from the series, is even more rich and fun... The child loses the passive status and becomes active, almost like the authors. 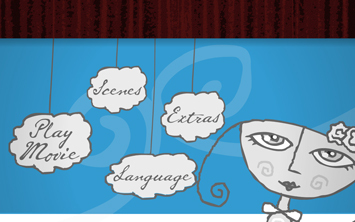 This simple "theatre game" has no strict rules, its main idea is to enhance creativity. Every animation on this CD - indeed, every animation in the entire project - is worth seeing for its own sake; but when they are viewed in conjunction with the original Tales, and the background information about Mazuranic herself, then a much more rich and complex picture emerges. This is a project with genuine popular appeal, which is bound to engage both children and adults: but it is also a slice of literary history, a valuable reminder of the importance of fairy stories to our literary traditions, and an introduction to the work, within that genre, of one of the best-known and best-loved Croatian authors. 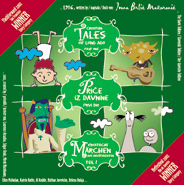 "Croatian Tales" is by far one of the best collections of flash-animated interactive stories to date. I personally feel that the collection of fairy tales enriches the lives of everyone while at the same time promotes a multicultural experience. Helena Bulaja has done an amazing job of collecting a group of talented and unique animators to bring to life fairy tales from the Croatian literary work of Ivana Brlic Mazuranic. I eagerly await Helena's next project. "Croatian Tales of Long Ago" signals a positive change in the art of animation: digital innovation, cultural expression, and, best of all, international cooperation. This collection of funny, touching and cool films is the Croatian cultural trump card of the decade! 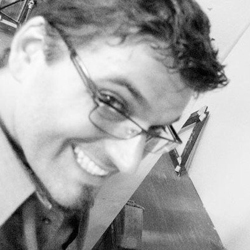 Personal favorite of your reviewer is "Quest" created by Australian Jurevicius. It's a true rock-n-roll workout of the Slavic tradition, completely unusual and visually unforgettable cartoon where ancient Slavic folklore is centrifuged trough the contemporary media culture. Jurevicius' "Quest" in its media is what would happen if Nick Cave would re-make a Croatian folk song. Ivana Brlic Mazuranic is still my favorite writer, and "Croatian Tales of Long Ago" is the best thing to have happened during my work on promoting Croatian animation as the commissioner of the Ministry of Culture. This is the best thing that's happened in Croatian cinematography in last ten years! The best thing to have happened to Croatian cinematography in past 10 years! "Croatian Tales" is one of the most complex collaborative project in the growing field of Flash animation ever undertaken. It shows a stunning mix of traditional cartoon animation and the new possibilities of Flash, in the most poetic of ways. Combining a minimalist aesthetic, unique and imaginative art and design, original storytelling and a super cool sense of humor, the project "Croatian Tales" shows us that fairytales are alive and well today, as vital and vibrant as ever in this most modern retelling. Present official version of the project - the CD-ROM with first 4 multimedia adaptations of Ivana Brlić Mažuranić's stories - is simply extraordinary in all its aspects. Croatian Tales of Long Ago (Part One) ... can be expected to appeal to adults just as much as children. It is a really exciting piece of hyperliterature: unpretentious, with genuine popular appeal, but not in the least shallow, sentimental or patronising to its audience. It has rightly won a hatful of international awards. If this CD and its companion volume meet with the commercial success they deserve, we can expect to see a lot more work of this type appearing in the next few years. Let's hope it's all up to the same high standard. Based on Croatian Fairy Tales of Long Ago, this series of storybooks brought to life is beautiful, simple to navigate, and captivating. A must see both to read, and be inspired!